"Wanganui" redirects here. For the school in Australia, see Wanganui Park Secondary College. For other uses, see Whanganui (disambiguation). Whanganui (/ˈhwɒŋənuːi/; Māori: [ɸaŋanui]), also spelled Wanganui, is a city on the west coast of the North Island of New Zealand. The Whanganui River, New Zealand's longest navigable waterway, runs from Mount Tongariro to the sea. Whanganui is part of the Manawatu-Wanganui region. Like several New Zealand centres, it was officially designated a city until administrative reorganisation in 1989, and is now run by a District Council. Although the city was called Wanganui from 1854, in February 2009, the New Zealand Geographic Board recommended the spelling be changed to "Whanganui". In December 2009, the government decided that while either spelling was acceptable, Crown agencies would use the Whanganui spelling. On 17 November 2015, Land Information New Zealand (LINZ) announced that Wanganui District would be renamed to Whanganui District. This changed the official name of the District Council, and, because Whanganui is not a city but a district, the official name of the urban area as well. Whanganui is located on the South Taranaki Bight, close to the mouth of the Whanganui River. It is 200 kilometres north of Wellington and 75 kilometres northwest of Palmerston North, at the junction of State Highways 3 and 4. Most of the city lies on the river's northwestern bank, due to the greater extent of flat land. The river is crossed by four bridges – Cobham Bridge, City Bridge, Dublin Street Bridge and Aramoho Railway Bridge (rail and pedestrians only). Both Mount Ruapehu and Mount Taranaki can be seen from Durie Hill and other vantage points around the city. The area around the mouth of the Whanganui river was a major site of pre-European Māori settlement. The pā named Pūtiki (a contraction of Pūtikiwharanui) was and is home to the Ngāti Tūpoho hapū of the iwi Te Āti Haunui-a-Pāpārangi. It took its name from the legendary explorer Tamatea Pōkai Whenua, who sent a servant ashore to find flax for tying up his topknot (pūtiki). In the 1820s coastal tribes in the area assaulted the Kapiti Island stronghold of Ngāti Toa chief Te Rauparaha. Te Rauparaha retaliated in 1830 sacking Pūtiki and slaughtering the inhabitants. 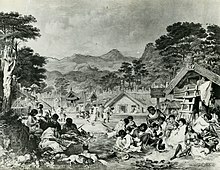 The first European traders arrived in 1831, followed in 1840 by missionaries Octavius Hadfield and Henry Williams who collected signatures for the Treaty of Waitangi. On 20 June 1840, the Revd John Mason, Mrs Mason, Mr Richard Matthews (a lay catechist) and his wife Johanna arrived to establish a mission station of the Church Missionary Society (CMS). The Revd Richard Taylor joined the CMS mission station in 1843. The Revd Mason drowned on 5 January 1843 while crossing the Turakina River. By 1844 the brick church built by Mason was inadequate to meet the needs of the congregation and it had been damaged in an earthquake. A new church was built under the supervision of Taylor, with the timber supplied by each pā on the river in proportion to its size and number of Christians. After the New Zealand Company had settled Wellington it looked for other suitable places for settlers. Edward Wakefield, son of Edward Gibbon Wakefield, negotiated the sale of 40,000 acres in 1840, and a town named Petre – after Lord Petre, one of the directors of the New Zealand Company – was established four kilometres from the river mouth. The settlement was threatened in 1846 by Te Mamaku, a chief from up the Whanganui River. The British military arrived on 13 December 1846 to defend the township. Two stockades, the Rutland and York, were built to defend the settlers. Two minor battles were fought on 19 May and 19 July 1847 and after a stalemate the up river iwi returned home. By 1850 Te Mamaku was receiving Christian instruction from Revd Taylor. There were further incidents in 1847 when four members of the Gilfillan family were murdered and their house plundered. The name of the city was officially changed to Wanganui on 20 January 1854. The early years of the new city were problematic. Purchase of land from the local tribes had been haphazard and irregular, and as such many Māori were angered with the influx of Pākehā onto land that they still claimed. It was not until the town had been established for eight years that agreements were finally reached between the colonials and local tribes, and some resentment continued (and still filters through to the present day). Wanganui grew rapidly after this time, with land being cleared for pasture. The town was a major military centre during the New Zealand Wars of the 1860s, although local Māori at Pūtiki led by Te Keepa Te Rangihiwinui remained friendly to settlers. In 1871 a town bridge was built, followed six years later by a railway bridge at Aramoho. Wanganui was linked by rail to both New Plymouth and Wellington by 1886. The town was incorporated as a Borough on 1 February 1872, and declared a city on 1 July 1924. Perhaps Wanganui's biggest scandal happened in 1920, when Mayor Charles Mackay shot and wounded a young poet, Walter D'Arcy Cresswell, who had been blackmailing him over his homosexuality. Mackay served seven years in prison and his name was erased from the town's civic monuments, while Cresswell (himself homosexual) was praised as a "wholesome-minded young man". Mackay's name was restored to the foundation stone of the Sarjeant Gallery in 1985. The Whanganui River catchment is seen as a sacred area to Māori, and the Whanganui region is still seen as a focal point for any resentment over land ownership. In 1995, Moutoa Gardens in Wanganui, known to local Māori as Pakaitore, were occupied for 79 days in a mainly peaceful protest by the Whanganui iwi over land claims. Wanganui was the site of the New Zealand Police Law Enforcement System (LES) from 1976 to 1995. An early Sperry mainframe computer-based intelligence and data management system, it was known colloquially as the "Wanganui Computer". The data centre housing it was subject to New Zealand's highest profile suicide bombing in 1982 when anarchist Neil Roberts detonated a gelignite bomb in the entry foyer. Roberts was the only casualty of the bombing. Whāngā nui is a Māori language phrase meaning big bay or big harbour. Europeans called it Petre (pronounced Peter), after Lord Petre, an officer of the New Zealand Company, but that name did not persist. In the local dialect, Māori pronounce the phoneme wh as [ˀw], a w combined with a glottal stop,[dubious – discuss] and the name as something like "'Wanganui", hard to reproduce by non-locals. Until recently it was generally written as "Wanganui" and pronounced with a w by non-speakers of Māori and a wh ([f] or [ɸ]) by those Māori speakers from other areas who knew its derivation. Following an article about the river by David Young in the New Zealand Geographic magazine that used "Whanganui" throughout, in accord with the wishes of the local iwi, the spelling of the river's name reverted to Whanganui in 1991. The region's name is now also spelt "Whanganui", but the city has a mixture of spellings. A non-binding referendum was held in Wanganui in 2006, where 82 percent voted for Wanganui without an 'h'. Turnout was 55.4 percent. In February 2009, the New Zealand Geographic Board received a proposal that the town's name should be spelt "Whanganui", and in late March found there was a good case for the change. The public was given three months to comment on the proposed change, beginning in mid May. About equal numbers of submissions supported and opposed the change. Wanganui Mayor Michael Laws spoke strongly against the proposed change. Another referendum was held in Wanganui in May 2009 and residents again rejected changing the town's name 77-22. Turnout was 60%. The Geographic Board decided in September 2009 that the name should be spelt "Whanganui", but the decision waited for review by the Minister for Land Information. In December 2009 the government decided that while either spelling was acceptable, Crown agencies would use the Whanganui spelling. Despite this, some government agencies still use the Wanganui spelling. On 17 November 2015 Land Information New Zealand Toitū te whenua (LINZ) announced that Wanganui District would be renamed to Whanganui District. This changed the official name of the District Council, and, because Whanganui is not a city but a district, the official name of the urban area as well. As of June 2017,[update] the region of which Whanganui District is a part is still officially named Manawatu-Wanganui. Whanganui has a strong industry base, with a history of niche manufacturing. Current businesses include Q-West Boat Builders, based at the Port who have built boats for customers from around New Zealand and the world and were awarded a contract in 2015 to build two 34-meter passenger ferries for Auckland ferry company Fullers. Pacific Helmets is another example of award-winning niche manufacturing in the district, winning a Silver Pin at the Best Design Awards in October 2015. Much of Whanganui's economy relates directly to the fertile and prosperous farming hinterland near the town. Whanganui is well known for embracing the production of several new pear varieties, including the Crimson Gem. However, in May 2016 it was reported that the majority of the Whanganui pear crop had been wiped out prior to the upcoming pear season. Heads Road is Whanganui's main industrial area and is home to a number of manufacturing and engineering operations. The Wanganui Port, once the centre of industrial transport, still has some traffic but is more noted for the Q-West boat building operation there. F. Whitlock & Sons Ltd was a notable company first established in 1902. Whanganui Airport is served by Air Chathams with flights to Auckland. Horizons Regional Council, under their Go! brand, contracts eight weekday urban bus routes within the city and a Saturday route which combines parts of four of the routes to serve the northern part of the city. The regional council also runs commuter buses to Palmerston North, and monthly buses from Taihape. The services are all operated by Tranzit Group. It enjoys a temperate climate, with slightly above the national average sunshine (2100 hours per annum), and about 900 mm of annual rainfall. Several light frosts are normally experienced in winter. The river is prone to flooding after heavy rain in the catchment, and in June 2015 record flooding occurred with 100 households evacuated. Whanganui's climate is particularly moderate. In 2012, the Federated Farmers Whanganui president, Brian Doughty, said the district's temperate climate meant any type of farming was viable. The Whanganui District covers 2337 km2, the majority of which is hill country, with a narrow coastal strip of flat land and a major urban settlement on the lower banks of the Whanganui River. A large proportion of this is within the Whanganui National Park. The region is known for its outstanding natural environment with the Whanganui Awa (River) at its heart. It is the second largest river in the North Island, the longest navigable waterway in the country, and covers 290 kilometres from the heights of Mount Tongariro to Wanganui's coast and the Tasman Sea. Every bend and rapid of the river (there are 239 listed rapids) has a guardian, or kaitiaki, who maintains the mauri (life force) of that stretch of the river. Whanganui hapū (sub-tribes) were renowned for their canoeing skills and maintained extensive networks of weirs and fishing traps along the River. Generations of river iwi have learned to use and protect this great taonga (treasure) and on 13 September 2012 the Whanganui River became the first river in the world to gain recognition as a legal identity. Today the River and its surrounds are used for a number of recreational activities including kayaking, jet boating, tramping, cycling and camping. A national cycleway has recently opened, which takes cyclists from the 'mountains to the sea'. The Whanganui National Park provides protection for native flora and fauna and was established in 1986. In the local government reorganisation of the 1980s, Wanganui District Council resulted from the amalgamation in 1989 of Wanganui County Council, most of Waitotara County Council, a small part of Stratford County Council, and Wanganui City Council. Hamish McDouall was elected mayor in the 2016 local government elections. All but some -40,900 people in the Whanganui District live in the township itself, meaning there are few prominent outlying settlements. A small but notable village is Jerusalem, which was home to Mother Mary Joseph Aubert and the poet James K. Baxter. The Whanganui District is also home to other settlements with small populations, including Kaitoke, Upokongaro, Kai Iwi/Mowhanau, Aberfeldy, Westmere, Maxwell, Marybank, Okoia and Fordell. Wanganui Collegiate School is located in Liverpool Street, central Whanganui. It was founded by a land grant in 1852 by the Governor of New Zealand, Sir George Grey, to the Bishop of New Zealand, George Augustus Selwyn, for the purpose of establishing a school. It was originally a boys-only school but in 1991 began admitting girls at senior levels and went fully co-educational in 1999. The school celebrated its 150th anniversary in 2004. The school amalgamated with St George's School in 2010. The combined schools provide primary education for day students on the St George campus, and secondary education for day and boarding students on the Collegiate campus. Prince Edward, Earl of Wessex, spent two terms spanning 1982 and 1983 at the school as a junior master during his gap year. Whanganui City College is located in Ingestre Street, central Whanganui, and has had three names. Wanganui Technical College, established in 1911, became Wanganui Boys' College in 1964 and in 1994 it became Wanganui City College. Whanganui High School is located in Purnell Street. Whanganui Girls' College is located in Jones Street, Whanganui East, near the Dublin Street Bridge. Cullinane College is an integrated, co-educational college located in Peat Street, Aramoho. St. Dominic's College is in York Street, Gonville. Te Kura Kaupapa Māori o Te Atihaunui-A-Paparangi is located in Anaua Street, Putiki. Te Kura o Kokohuia is located at Matipo Street, Castlecliff. UCOL, Universal College of Learning, was founded in 1907 and was known as the Palmerston North Technical School. In 1971 it became the Palmerston North Technical Institute and in 1983 the Manawatu Polytechnic. At the time it specialised in trade apprenticeship courses, and in hobby, art, and craft classes, along with a range of night school programmes in business studies for working adults. UCOL expanded in January 2001 with the incorporation of the Wairarapa Regional Polytechnic and the integration of the Wanganui Regional Community Polytechnic on 1 April 2002. The Wanganui Regional Community Polytechnic is now called Whanganui UCOL and incorporates the Wanganui School of Design. Wanganui has a strong cultural and recreational focus. Queen's Park (Pukenamu) in the central township has several cultural institutions including the Sarjeant Gallery, the Whanganui Regional Museum, the Davis Library, the Alexander Heritage and Research Library, and the Wanganui War Memorial Centre. Wanganui is home to New Zealand's only glass school and is renowned for its glass art. The Sarjeant Gallery Te Whare o Rehua Whanganui, an art gallery. There are more than 8,000 artworks in the Sarjeant Gallery, initially focused on 19th and early 20th century British and European art but, given the expansive terms of the will of benefactor Henry Sarjeant, the collection now spans 16th century through to 21st century. Among the collections are historic and modern works in all media – on paper, sculptures, pottery, ceramics and glass; bronze works; video art; and paintings by contemporary artists and old masters. The Gallery holds notable works by Edward Coley Burne-Jones, Domenico Piola, Frank Brangwyn, Bernardino Poccetti, Gaspard Dughet, William Richmond, William Etty, Lelio Orsi, Frederick Goodall, Augustus John and others. Its New Zealand holdings include six works by Wanganui artist Herbert Ivan Babbage and a major collection of works by the Whanganui-born Edith Collier. Potters have a long history of working in the area Rick Rudd, Paul Rayner, Ivan Vostinar and Ross Mitchell-Anyon. Largely as a result of the activities of UCOL School of Art, the town has become particularly identified with hot glass, and to a lesser extent 'warm' or kiln-formed glass. Chronicle Glass is a prominent local studio. Award-winning local glass artists include Dr Kathryn Wightman, Lisa Walsh, and Claudia Borella. A Repertory group has been active in the town since 1933. Pukenamu–Queens Park in central Whanganui, formerly the hilltop location of the Rutland Stockade, is home to several iconic buildings. The Sarjeant Gallery, a Category I Historic Place, was a bequest to the town by local farmer Henry Sarjeant, and opened in 1919. Since 2014 it has been in temporary premises on Taupo Quay while the heritage building is strengthened and redeveloped. The Whanganui Regional Museum (1928) and the Alexander Heritage and Research Library (1933) were both bequests of the Alexander family. The award-winning Whanganui War Memorial Hall (1960) is one of New Zealand's finest examples of modernist architecture. The Royal Wanganui Opera House is located in St Hill Street in central Whanganui. Stewart House on the corner of Campbell and Plymouth Streets is now a private home, but it was formerly the Karitane Home and later a boarding residence for secondary school students. It was built for philanthropist John Tiffin Stewart and social activist Frances Ann Stewart. There are two large towers overlooking Whanganui: the Durie Hill War Memorial Tower and the Bastia Hill Water Tower. The Durie Hill Tower is a World War I memorial, unveiled in 1926. Nearby is the Durie Hill Elevator (1919), which links the hilltop with Anzac Parade via a 66 m elevator and a 200 m underground tunnel. South of Whanganui is the Cameron Blockhouse. A panoramic view of Wanganui, New Zealand, from the top of the War Memorial Tower on Durie Hill. In the centre is Wanganui City Bridge. Richard Taylor was one of the early missionaries and travelled widely through the region. The Society of St Pius X's main base of operations in New Zealand is in Wanganui. Whanganui has three local newspapers. Whanganui was the first town in the wider Wellington region to have its own newspaper, the Wanganui Record which was first published in 1853. The Whanganui Chronicle, founded in 1856, is New Zealand's oldest newspaper, and has been a daily paper since 1871. Its rival from the 1860s onward was the Evening Herald (later the Wanganui Herald), founded by John Ballance. Initially, the production of the Wanganui Chronicle was held back by a lack of equipment, meaning the first issue dated 18 September 1856, was produced on a makeshift press, made by staff and pupils at the local industrial school. Shortly afterwards, the founder, Henry Stokes, imported a press from Sydney. The two daily papers joined in the 1970s, and in 1986 the Herald became a free weekly, later renamed the Wanganui Midweek.The River City Press is the other free weekly paper. Wanganui is one of the oldest rugby unions in New Zealand, but has never held the country's top trophy, the Ranfurly Shield. The Whanganui environs have produced many All Blacks including Andrew Donald, Bill Osborne, Buff Milner, George Bullock-Douglas, Glen Osborne, Harrison Rowley, John Blair, John Hogan, Moke Belliss, Mona Thomson, Pat Potaka, Peina Taituha, Peter Henderson, Peter Johns, Peter McDonnell, Peter Murray, Sandy McNicol and Keith Gudsell who also played three tests for the Wallabies. Although from the Manawatu, 1987 Rugby World Cup winning All Black Captain David Kirk was a student at Wanganui Collegiate School. In 2008 the Wanganui representative rugby team under the captaincy of David Gower, won the NZRFU's Heartland Championship (Meads Cup) by defeating Mid Canterbury 27-12 in the final. They had previously been the defeated finalist in 2006 and 2007. The 2008 side had an undefeated season – the first since 1947. The rugby squad, including coach and management, was accorded the honour of 'Freedom of the City' by the Whanganui District Council – the first time the award had been given to any sporting team. The 2009 representative team repeated this feat by regaining the Meads Cup – again defeating Mid Canterbury in the final by 34 points to 13 (after trailing nil-13 at halftime). Unlike 2008, the 2009 did lose games (to Wellington, Wairarapa Bush and Mid Canterbury) but came good at the business end of the season. Ten Whanganui players were selected for the Heartland XV. The Wanganui rugby jersey, due to its resemblance, is known as the butcher's apron. Whanganui has several high quality sporting venues including Cooks Gardens which is a major sporting venue used for cricket, athletics and rugby. On 27 January 1962, a world record time of 3 minutes 54.4 seconds for running the mile was set by Peter Snell on the grass track at the gardens. The venue also has a world-class velodrome. The Cemetery Circuit is a temporary motorcycle street racetrack in downtown Whanganui which passes through the old cemetery and industrial area near to the centre of town. The event is usually held on Boxing Day each year. Rod Coleman was a Grand Prix motorcycle road racer. The Wanganui District Council decided in 2008 to formally end its sister city relationship with Reno, Nevada, USA after years of inactivity. The relationship was parodied on "The Prefect of Wanganui" episode of Reno 911!. The Royal Wanganui Opera House in 2013. ^ "Residents free to choose city's spelling". TVNZ. Retrieved 19 January 2015. ^ "Notice of the Determination of the Minister for Land Information on Assigning Alternative Geographic Names". Land Information New Zealand. 13 December 2012. Retrieved 16 March 2013. ^ a b "Whanganui or Wanganui – it's up to you". The New Zealand Herald. 18 December 2009. ^ a b "'H' to be added to Wanganui District name". Land Information New Zealand (LINZ). 17 November 2015. Retrieved 2 February 2016. ^ "Pūtiki Pā". Māori Maps. Retrieved 3 December 2015. ^ Young, David (24 August 2015). "Whanganui tribes". Te Ara – the Encyclopedia of New Zealand. Retrieved 3 December 2015. ^ a b c d e Wises New Zealand Guide, 7th Edition, 1979. p. 494. ^ "Pre 1839 Settlers in New Zealand". Sites.google.com. ^ a b Rogers, Lawrence M. (1973). Te Wiremu: A Biography of Henry Williams. Pegasus Press. ^ "The Church Missionary Gleaner, July 1843". Progress of the Gospel in the Western District of New Zealand – the death of Rev J Mason. Adam Matthew Digital. Retrieved 12 October 2015. (Subscription required (help)). ^ "The Church Missionary Gleaner, June 1845". Erection of Places of Worship in New Zealand. Adam Matthew Digital. Retrieved 13 October 2015. (Subscription required (help)). ^ a b "The Church Missionary Gleaner, December 1850". The Chief Mamaku. Adam Matthew Digital. Retrieved 17 October 2015. (Subscription required (help)). ^ "The Church Missionary Gleaner, January 1854". The Murderer Rangiirihau. Adam Matthew Digital. Retrieved 18 October 2015. (Subscription required (help)). ^ "Charles Mackay and D'Arcy Cresswell". Retrieved 10 October 2007. ^ "Wanganui mayor shoots poet". Retrieved 17 April 2011. ^ a b "Wanganui spelling change slammed". Stuff. Retrieved 19 January 2015. ^ a b "Whanganui decision 'great day for city' – Turia". The New Zealand Herald. 17 September 2009. Retrieved 17 September 2009. ^ "Results of Referendum 09". 21 May 2009. Retrieved 22 May 2009. ^ "Education Organisations in Wanganui – Open and close a beehive, work in an apiary, and feed a beehive". Nzta.govt.nz. Retrieved 19 January 2015. ^ "The Smart21 Communities". Intelligent Community Forum. Retrieved 1 April 2015. ^ Maslin. "Boat Building Business Booms". Wanganui Chronicle. Retrieved 1 April 2015. ^ "Building better boats". Crown Fibre Holdings. Retrieved 1 April 2015. ^ Maslin, John. "Pride of Wanganui heads to open water for first sea trial" (12 September 2014). APN. New Zealand Herald. Retrieved 1 April 2015. ^ "At the Helm – Q-West's success story". m.nzherald.co.nz. Retrieved 15 November 2015. ^ "Helmet designed in Wanganui wins elite award". m.nzherald.co.nz. Retrieved 15 November 2015. ^ "New pear varieties going down a treat". New Zealand Herald. Retrieved 2019-04-11. ^ "Death of Mr F. Whitlock". Wanganui Chronicle. L (12145). 24 August 1908. p. 5. Retrieved 12 January 2014. ^ "Whanganui Schedule". Air Chathams. Retrieved 13 August 2016. ^ "Boost for Whanganui from Air Chathams service - mayor". Radio New Zealand. 1 August 2016. Retrieved 26 September 2018. ^ "General Bus Info". Horizons Regional Council. Archived from the original on 26 September 2018. Retrieved 26 September 2018. ^ "ELECTION RESULTS - WHANGANUI". Wanganui Chronicle. 8 October 2016. Retrieved 9 October 2016. ^ "Headmaster's Welcome". Wanganui Collegiate. Archived from the original on 27 May 2010. Retrieved 27 May 2010. ^ Robinson, Penny (2011). Celebrating an Education. p. 3. ISBN 978-0-473-18434-6. ^ Williams, Sarah (18 February 2015). "Busy pottering in Castlecliff". New Zealand Herald. ISSN 1170-0777. Retrieved 15 November 2015. ^ "ZOO: Ivan Vostinar & Lorien Stern | The Big Idea | Te Aria Nui". www.thebigidea.co.nz. Retrieved 15 November 2015. ^ McDonald, Anne Marie (13 December 2015). "A glass act". Wanganui Chronicle. Retrieved 3 February 2016. ^ "Clear-cut win for Whanganui glass artist | Scoop News". www.scoop.co.nz. Retrieved 2 February 2016. ^ "NZ glass art student wins prestigious award | Creative New Zealand". www.creativenz.govt.nz. Retrieved 2 February 2016. ^ "Claudia Borella – 2007 Finalists – Ranamok". www.ranamok.com. Retrieved 2 February 2016. ^ "Sarjeant Gallery". Register of Historic Places. Heritage New Zealand. Retrieved 3 June 2012. ^ "War Memorial Hall". Whanganui District Library. Whanganui District Council. Retrieved 12 April 2016. ^ "Power, W. Tyrone, (William Tyrone) (1819-1911)". National Library of Australia. ^ a b c "Wanganui Chronicle". Papers Past. National Library of New Zealand. Retrieved 12 April 2019. 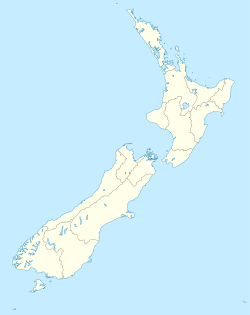 ^ "Sport regions (New Zealand)". Crwflags.com. Retrieved 19 January 2015. ^ "Unifying the image". Community Link. Wanganui District Council (324). 16 August 2007. Retrieved 18 December 2011. ^ Coleman, Rod. Colemans of Wanganui The way we were. Whanganui: H&A. ISBN 978 0 473 31078 3. ^ Wood, Simon (26 February 2009). "Laws questions value of sister city relationship". Wanganui Chronicle. Archived from the original on 13 March 2009. Wikimedia Commons has media related to Whanganui. Wikivoyage has a travel guide for Wanganui. This page was last edited on 18 April 2019, at 14:28 (UTC).